UPDATED: Thu., July 26, 2018, 10:47 p.m. Sometimes it’s not how hard you hit them – they just have to be in the right place. Tied at 3 in the bottom of the eighth, catcher Isaias Quiroz – who had struck out twice earlier – hit a looping, broken-bat liner with the bases loaded that barely cleared the outstretched arms of a drawn-in infield to plate the go-ahead run. The contact could not have been any softer. Funny sometimes how a hero is born. 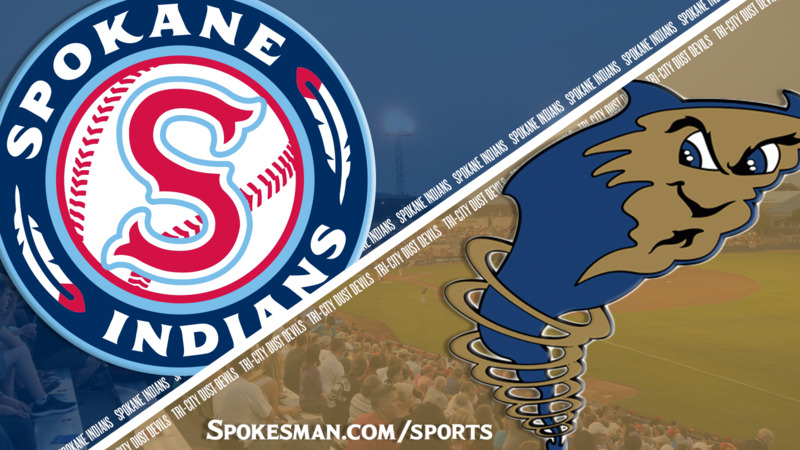 Quiroz’s unlikely base hit helped the Spokane Indians win their third in a row to start the second half, sweeping the Tri-City Dust Devils 5-3 at Avista Stadium on Thursday. The Indians (3-0) retain the only perfect record in the second half in the Northwest League season. Spokane’s Diosbel Arias went 3 for 4 with an RBI and run. Starter Seth Nordlin threw for eight innings in a win last time out against Salem-Keizer, the longest outing by an Indians starter this season. The righty had picked up wins in back-to-back outings. Against Tri-City, the 13th-round pick in the 2017 MLB Draft struck out eight and allowed three runs on seven hits – including a pair of home runs – and a walk over 6 1/3 innings and did not factor in the decision. Nordlin has registered seven or more strikeouts in four of his last six starts. Tri-City starter Omar Cruz impressed in his NWL debut last Friday, tossing five shutout innings with six strikeouts. He followed that up with another sharp stint, allowing one run on four hits and a walk with eight strikeouts over 4 2/3 innings. The offense gave Nordlin something to work with in the first. Leadoff hitter Jax Biggers was hit by a pitch and went to second when J.P. Martinez drew a walk. Curtis Terry hit a hard grounder to third that was bobbled, but Elvis Sabala recovered to start a 5-4-3 double play, with Biggers advancing to third. After a double play, Arias plated Biggers with a line-drive single to right. Tri-City (0-3) bounced back in the second. Olivier Basabe led off with a single and Justin Paulsen lined one down the right-field line that just cleared the fence for a two-run shot. Dwanya Williams-Sutton drew a walk, but Nordlin settled down to get the next two batters. Isaias Quiroz then threw out Williams-Sutton on a steal attempt to end the inning. Nordlin struck out the first two hitters in the third, but Tre Carter launched one off the scoreboard in right-center to make it 3-1. The Indians put two on with one out in the fifth as Quiroz walked and Biggers extended his hitting streak to 11 games with a single. Cruz struck out Martinez for the second out and was lifted for reliever Korey Anderson, who got Terry on a comebacker to end the threat. Arias led off the sixth with a double off the wall in right, Jonah McReynolds walked and Cristian Inoa plated a run with a ground-ball single to left to make it 3-2. Hasuan Viera bunted his way on to load the bases for Quiroz, who struck out. But Starling Joseph followed and his fly out to deep right brought in the tying run. Nordlin retired nine in a row after a strikeout at the start of the seventh. Back-to-back singles put him in hot water and Maldonado came out with the hook. Reliever Wes Robertson struck out No. 9 hitter Sabala and walked Grant Little to load the bases, but got Carter to bounce out to second to leave it tied. McReynolds led off the eighth with a single to right. Inoa attempted a sacrifice, but reliever Wen-Hua Sung couldn’t get the ball out of his glove, then threw it away, allowing both runners to move up. Viera – who hadn’t played since Monday and had just 26 at-bats in the month – drew a walk to load the bases. Quiroz’s soft liner barely eluded the leaping second baseman Basabe to plate the go-ahead run. Joseph hit into a force at home, but Biggers lofted one to medium right-center to bring home an insurance run. Published: July 26, 2018, 9:34 p.m. Updated: July 26, 2018, 10:47 p.m.